A late Happy Mothers Day! My son sent me a beautiful box full of tulips. In fact, there were so many I put them in three different vases and took one up to the studio. It's hard to get a great picture but here they are with the under counter lights on. I love this pitcher -- I'm sure it was one of my grandmother's. I think it is Wedgwood but it's upstairs in the studio and I'm downstairs. The pattern is from Accuquilt and has flying geese and flowers. I needed four flying geese colors: green purple, blue and yellow. All but the blue and green also will be flowers. The green will be leaves and stems. Except, looking at the picture I thought the yellow geese really stuck out. And then I noticed the flowers. (darn blogger -- I was trying to add typing next to these flowers but it won't let me. Nor will it let me center it now. Grumble, grumble.) 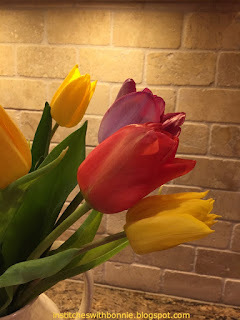 I noticed I had the green, the yellow but, there is a beautiful rosy colored tulip hiding behind the pink one. Could I find something that came close to that color? Why, yes, yes I can find a deep rose color. Orange is for star flowers, yellow is for centers. The rose and purple will be various flowers and the greens are still the stems and leaves. I love this so far. Today I cut out all of the flying geese parts and the white. 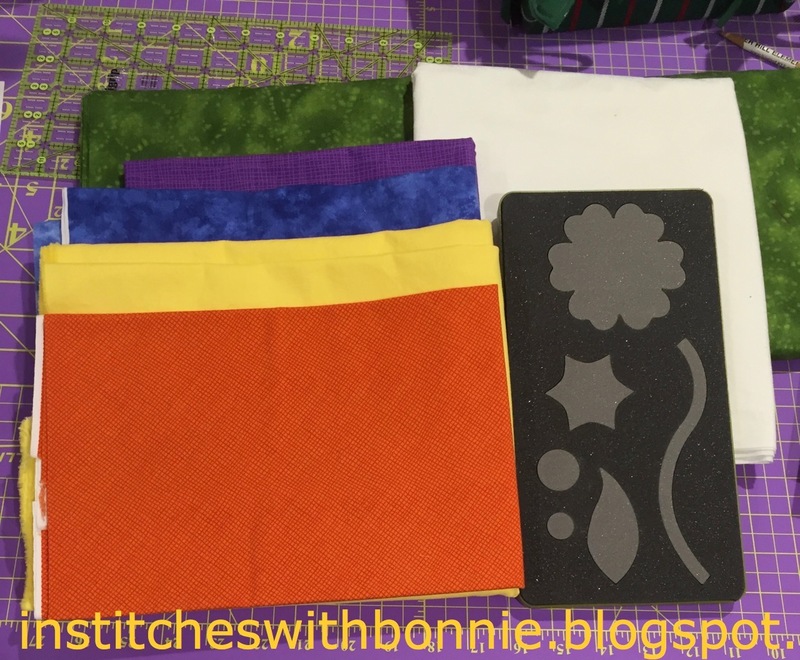 Tomorrow I will iron on the fusible web (hopefully I have enough) and then will cut them out. This is all being kitted up for the FCQ retreat starting a week from Friday. Sunday we are going to the beach house and meet some good friends from college days. So I only have between now and Saturday to make up a few kits to take to retreat. I also finished quilting a donation quilt for the hospital NICU. It's hard to see but I was extremely lucky on this quilt. 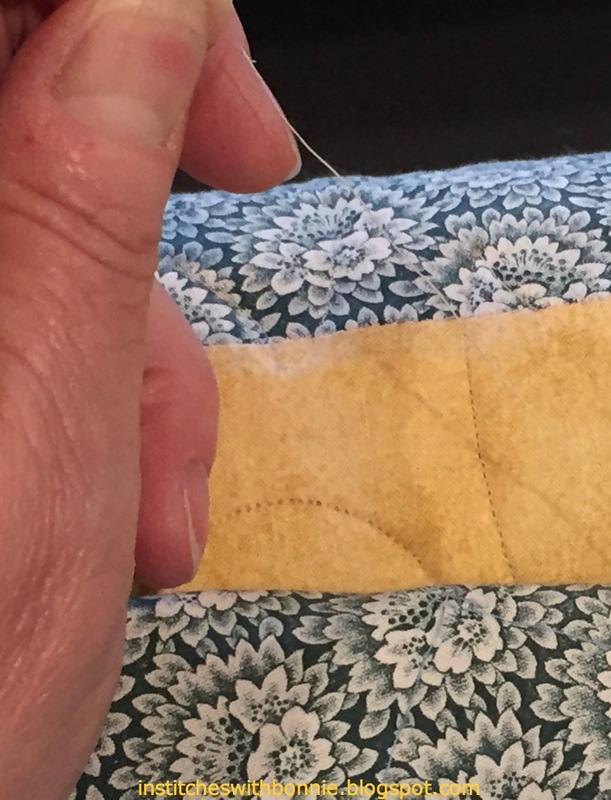 I'm holding about 4" of thread which came off the bobbin on the last row. Yep, for once I came very close but did not run out! YEA! I will probably cut and make the binding and then take that on retreat too. Getting this quilted leads me right into my weekly goals. I really didn't do all that well on them last week. It's probably not going to be all that great this week either. We've got several things planned that will have us out of the house. That's enough goals for this week. I'm linking up with Monday Making, Main Crush Monday and Moving It Forward. Take a look at what's happening in studios across the Internet. 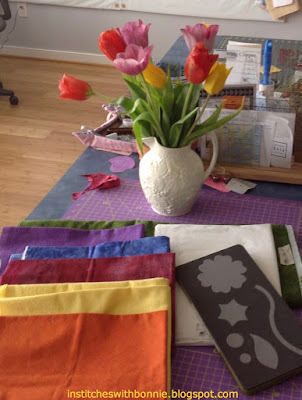 Love the colors you've chosen for your next project. Looking forward to seeing it come together. Beautiful tulips. Boy how lucky were you on the bobbin. My luck is more likely to run our 4 inches from finishing! Your tulips are beautiful, and so are the fabrics you selected for the next quilt. I never think to use pitchers for vases. 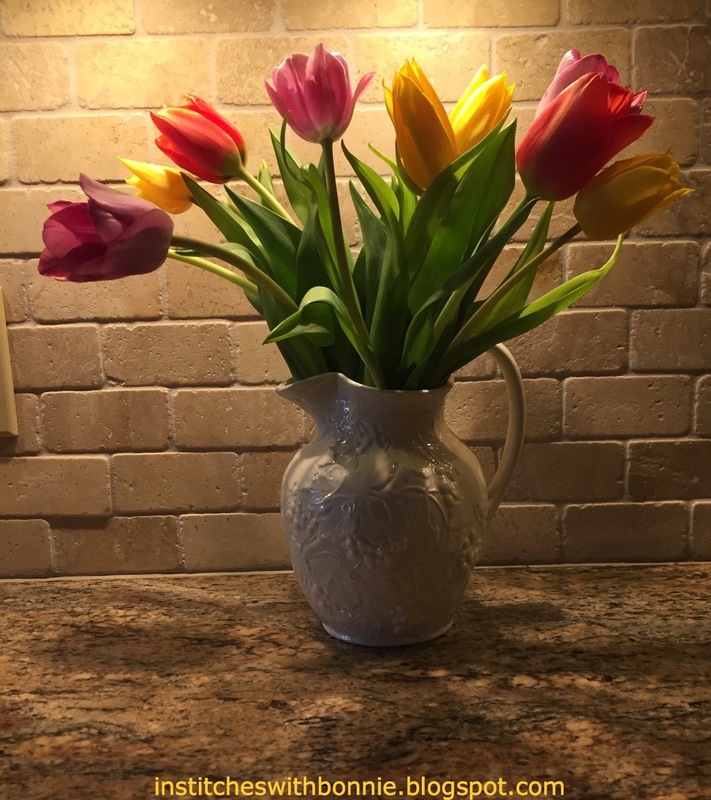 I must remember how lovely your tulips look in your treasured pitcher. Pulling colors from nature is brilliant. Your quilt will be stunning.